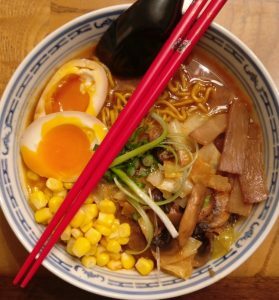 So if you have been keeping track I have been doing one style of ramen each week. That means some poor animal is sacrificed to the gods of ramen. Bones are split and blanched. Fat is rendered and flavored. Broth is simmered and stored. Eggs are in constant motion. Toppings are crisped up and seasoned. And the kitchen and prep areas take some abuse. I clean with white vinegar. I know, it sounds like I am some Birkenstock slinging hemp-head with an anti-vaccine bumper sticker but white vinegar is about the only cleanser that seems to cut right through the scum created when simmering broths and cleaning fats over the week. Having a squeeze bottle of 50% white vinegar (2.5% acetic acid by volume) and a pile of hand towels seems to be the best way to keep my kitchen and prep areas clean. I am a chemist by trade and training so I am aware that acetic acid is a very decent solvent even at 3-5%, which is the food grade concentration of vinegar. Going for the pure distilled white vinegar you will find a ton of uses. I use it as fabric softener. Dishwasher rinse aid. It’s my go to for baby spills and clean up. I have a microfiber cloth on my cutting board soaked in 50% vinegar and its a good solution to clean my blades before being wiped dry before they go back into the block. It saves trips back and forth frm the sink, which may be occupied. I use it to wipe down my cutting board surface, although I wonder if it is drying out the butcher block. They say vinegar can be used for everything but I am still not convinced for stainless steel or for oven parts. And there’s the smell, but it dissipates within an hour and helps break up the monotony of ramen funk. Previous Post My first video uploaded to the Uncommon Ramen Channel Youtube Account!